I'm often asked what life is like with a special needs child. The truth? Life isn't that much different than it was before Liam. Liam isn't that much different from a typical child. This answer, of course, is going to vary from parent to parent, because EVERY child is different. Honestly, parenting a typical child who has a severe food allergy could very well be more difficult than parenting a child who has Down Syndrome. 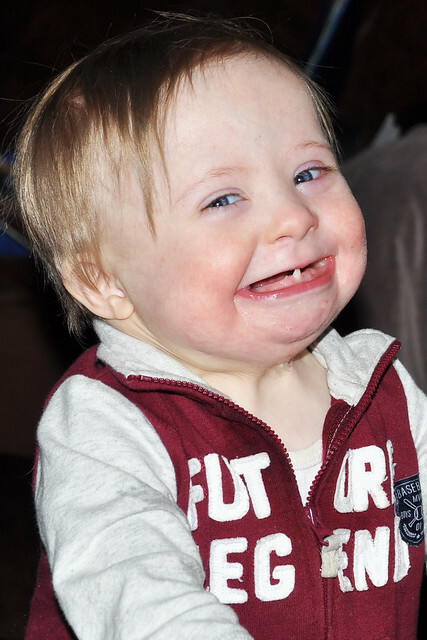 Parenting a child who has Down Syndrome and a heart defect is going to present more challenges than parenting a child who has Down Syndrome but no other health issues. We all have something difficult in our lives to deal with. It's just a matter of HOW we deal with it. When the pediatrician at the hospital told us what he suspected, it felt like life as we knew it had ended. It felt as if Liam's suspected diagnosis aged us 50 years and removed all the fun from our lives. I envisioned the rest of our lives spent in our home, keeping Liam hidden away from the world. As the fog cleared, I vowed to give Liam the best possible life and present him with every opportunity I possibly could. Once we were home from the hospital, the busyness of life took over. Liam was officially along for the ride. During his first week of life, we visited his pediatrician, welcomed many visitors into our home, toured Dylan and Lexie's schools, went out to eat, went shopping, went out for ice cream, visited both sets of grandparents, and went to a big end of summer party. Liam fit in so easily with our family and our busy lifestyle. We simply stopped thinking about the genetic tests that were being studied in a nearby lab, and focused on the boy who belonged with us. One morning, when Liam was just a few days old, he started fussing. Dylan, Lexie, and Lily raced into our room. They had been waiting to see him, and they were so excited that he was finally awake. They snuggled up around him and stayed there until he drifted back to sleep. The love and pride they had for their baby brother took my breath away. For the first time since those dreaded words were uttered in the delivery room, life felt perfect. In that moment, I knew that my husband's words in the delivery room were true. We COULD and we WOULD do this. Life isn't easy. It never is. It's not supposed to be. Parenting a child with Down Syndrome was a hurdle I never thought I would overcome, let alone accept. Yet, here we are, almost 18 months in, and we did it. We survived. It wasn't all rainbows and unicorns. But every single day was filled with smiles. Every. Single. Day. I never understood what it meant when parents of children with Down Syndrome would use the term "The Lucky Few." I get it now. There were a few moments filled with tears and frustration, but Liam always had a way of making everything okay. All it took was one look at his incredible, contagious smile! Most days, I even forgot that my son had that dreaded condition that really isn't as bad as it's made out to be. So, how is life different? He has more appointments than a typical child. Liam doesn't have any health issues, so for him, it's all preventative. He has a handful of appointments and tests every 6 months, in addition to his regular well checks with his pediatrician. It may seem overwhelming, but very soon, it will change to yearly. Early Intervention was the biggest change for us. Liam isn't very far behind developmentally, but he does receive one hour each of physical therapy, occupational therapy, and speech therapy every week. Having strangers come into our home was so weird at first, but now his team of therapists are his biggest supporters, and we are so thankful for them! One difference, which turned out to be a really good thing, was all the new people we met. The Down Syndrome Community is simply amazing. Without Liam, we would have never met these wonderful people! Despite a few worries over the past 18 months, Liam made our family and our lives better. His diagnosis brought some incredible people into our lives, made our family stronger, brought us closer to our friends, and made us all more aware. Liam changed the way we think. We don't take things for granted anymore, and we enjoy the everyday moments more than ever before. Although there have been some changes, our lifestyle hasn't changed one bit! We're still having fun, and Liam is living life to the fullest with everyone he loves! We still spend lots of time with family and friends. We still go out to eat. We still go to sporting events. We still attend school functions. We still attend social functions. We still go to storytime at the library. We still go to community events. We still go to parades. We still go for walks. We still go to the zoo. We still go to parks. We still go to countless birthday parties. We still pick pumpkins, pick strawberries, go on hayrides, go to splash pads, and play in the sand. We still dance around the house. We still have fun. So much fun. The life we are living now is the complete opposite of what I envisioned in the hospital. It may be difficult for some people to imagine or believe, but we are truly happy. We love Liam every bit as much as we love Dylan, Lexie, and Lily, and that love we have for him will never change. We are so proud of all four of our children, and so thankful we were given the opportunity to love and care for them. This So-Called Special Needs Life merged perfectly with normal life. We embraced it and made it work! The months flew by, and here we are, nearly 1 1/2 years into this journey. It's a journey that I never imagined we would take. It's a journey I never would have chosen. But now that I'm here, I would choose it again. A million times again. Anyone would be lucky to have you as a Mom. Love this post! ALL of your kids are so lucky to have you as a mom! I love this post! You have one great family. I read the article. It makes me so sad! A lot of times, these kids aren't even given a chance! Beautiful post. Liam completes your family so perfectly. Thank you so much. He sure does! He's adorable and you are an amazing Mom!